The all-new i60 Instruments from Raymarine offer boaters an excellent combination of great looks, high performance and extreme value. Designed to accommodate either stand-alone or fully integrated installations, the i60 instruments feature Raymarines exclusive SeaTalkng networking for simple installation and bullet-proof reliability. Each instrument offers extra-large digits, razor-sharp LCD displays and red backlighting for outstanding visibility in all lighting conditions. i60 Analog Instrument displays are fully compatible with our i70 Color Multifunction Instrument too. Boaters can now customize their systems with any combination of monochrome LCD, color LCD and analog instruments as needed. Raymarine also offers the p70 and p70R Color Autopilot controllers which also match with our instruments and multifunction displays. For the ultimate in flexibility the i60 Instruments support SeaTalkng 0 CANBUS networking, as well as our original SeaTalk 1 networking. This makes upgrading older instruments a breeze. Connect your analog depth, speed and wind transducers directly to respective instrument display, or use the displays as repeaters for SeaTalkng smart transducer data: the choice is yours. The ultra-sleek design of i60 line is designed to complement our full line of a-Series, c-Series and e-Series Multifunction displays, and looks great on the helm of any boat. Each instrument comes with a low-profile surface mounting kit and silicone rubber sun cover. An optional bracket mounting kit is also available separately. i60 Instruments are designed to operate from 12V DC power, and are ultra-efficient drawing less than 1W as repeaters, or 2.4W while hosting a transducer. All of the i60 Instruments are waterproof to IPX6 standards. The i60 instruments are all covered by Raymarines industry leading 2-year warranty, upgradeable to 3-years at no charge by registering online with 90 days of purchase. 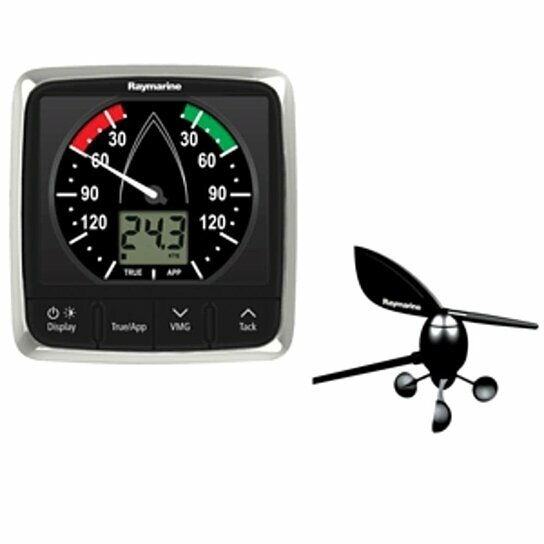 Full featured wind display for cruising and racing sailboats. The i60 Wind features an easy-to-read analog dial, nighttime red backlighting and high-contrast text and graphics. Alarms for high and low apparent wind angle, low true wind speed, and maximum true wind speed.